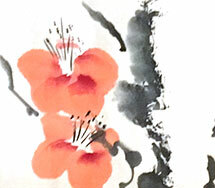 I am sad to say classes with my sumi-e sensei Ilan Yanizky will have to go on hold until I visit Tokyo again in the future, sooner than later I hope. I will miss the relaxed atmosphere of my sensei’s studio, which is adorned with his inspirational works and working with friends I have made. Thank you for the wonderful lessons. Today’s lesson continued from last week’s where the Ume blossom became part of a gnarly branch. 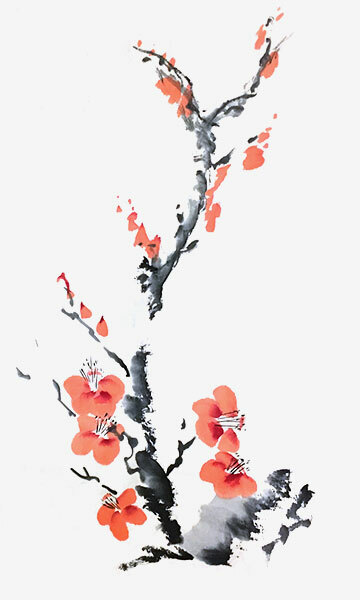 I was also permitted to paint using orange/red for the flowers. The colour reminds me more of the Japonica, or flowering quince as we call it in Sydney than Ume blossom. Talking about blossom, the Sakura is almost ready to burst into life especially after the last few warm days Tokyo has experienced. I may be lucky to see the Meguro River in partial bloom before I head home on Monday.